Add a colorful touch to your holiday gathering with these tips. Wondering what to do this year for your holiday decorating. With family coming for Thanksgiving you want to add a touch of color and warmth. 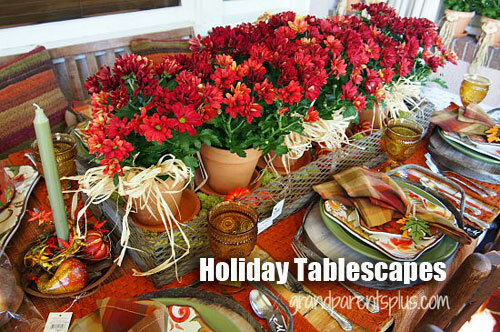 They key is to surround your home and create a tablescape with warm colors & terracotta tones. Add burnt orange blooms, petite pumpkins, and rustic touches with plain clay flowerpots. The terracotta pottery has a warm tone to it that compliments the orange and rust colored flowers. Line your table with pots of mums and geraniums so that after the holiday they will still last and you can enjoy the pots for months not days. Use clay flowerpots as place-cards, to hold crayons for children to use and have them decorate a picture you can all share. This is not the time for bright spring colored planters or plant materials. Rust, orange, wine, forest green, deep reds, terracotta, browns & burnt tones. Try to sprinkle a splash or two around the house. Place flowerpots on side tables on the entry hall. 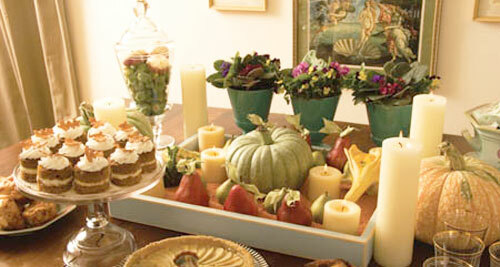 Of course, adding a few pumpkins or gourds always decorates things up. Don�t forget to put pots, pumpkins and mums at the front door so that your guests will be welcomed with a splash of color and a touch of the Thanksgiving holiday. Fill pots with candy corn and sweet treats. The point is to have fun, come up with clever ideas and enjoy the holiday. Read more.....Light up the night.